Typewriter is a project led by London based Mark Bandola, who first came to AI readers attention when we reviewed his earlier band Ausgang in issue #11. But Mark has apparently been busy over the years having been involved in numerous projects, one of which was the 80's band The Lucy Show. I'm not familiar with that group but the promo material notes that they toured with such bands as The Cocteau Twins, REM and New Order. According to the Typewriter web site the premise of the band is to take all of the styles and genres that could ever appeal to Bandola, and his collaborators, and fuse them together regardless of how disparate they might initially appear. Well if that's the intent then Bandola has more than succeeded. Skeleton Key consists of 31 tracks, nearly all ranging from less than a minute to 4 minutes. Full songs are separated by short transitional bits that cover a gamut of territory that is mostly characterized psychedelia in one form or another. Actually this is quite a fun roller coaster ride listen which never sits still for long, continually moving through a parade of themes and styles ranging from pop-psych, dense walls of guitar and drone, jazzy funk, free-jazz, and drifting hypnotic psychedelia. Bandola also likes playful tape manipulations that combine all manner of voice samples, atmospherics and general zaniness in an "I Am The Walrus" or "Revolution #9" style. Several of the songs have an 80's rock flavor, but there's loads of variety and some of them really grabbed me. Among the highlights is "When Our Lost Lamb Returns". A head boppin rockin rhythm section, dancey electronic beats, and Syd styled freakiness form the foundation for this excellent trippy pop-psych tune. "Channel 12 Chiller Thriller" consists of thudding, searing, spaced out metallic psychedelia. I would have liked to have heard this one developed beyond its mere 3 minutes. "Oblivion Now" has an 80's sound but it's well produced with lots of voice samples and spacey embellishments, and... well it's a damn good song. "Up Against Ze Wall" is a wild space rocker that has a strong early Hawkwind sound. "Emission Oblique" is a spacey robotic psych rock tune that I enjoyed. "Lemming's Night Out" is an excellent heavy rocker with John Foxx sounding vocals. And "City Lights Flightpath" is a spacey electro alien dance fest that seems to announce that the UFO has landed and its occupants are ready to party. The album flows surprisingly well given the abrupt stylistic changes that can occur from one track to the next. But I think it works because there are so many short bits that help to keep everything continually in transition, always changing form and mutating as the music weaves its way according to Bandola's whim. Overall it's quite a fun listen and it's clear that Bandola is a good songwriter as well as someone who knows how to utilize the studio to make interesting constructions. File under Freaky. 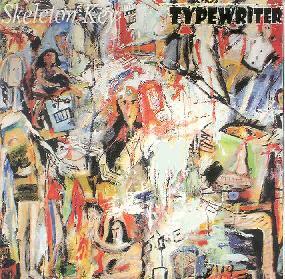 For more information you can visit the Typewriter web site at: http://www.typewriter-music.com. Contact via snail mail c/o Mark Bandola; 27 Eswyn Road; SW17 8TR; London, England.